Consuming vodka is a ritual with a historical background. No-one has the rights to refashion this wonderful ceremony. So, let me introduce this culture to you and explain what crime do the Brits commit when drinking this Gods beverage. Generally, it was a Western promotive idea to start selling RedBull in the parties areas to associate their brand with nightclub culture. Apparently, naive Americans found it very cool to mix the energy drink together with the shot a vodka and created a new kind of a breaking-down-traditions cocktail. Unfortunately, this ridiculous and wrong habit was spread to the rest of the world, including Great Britain. 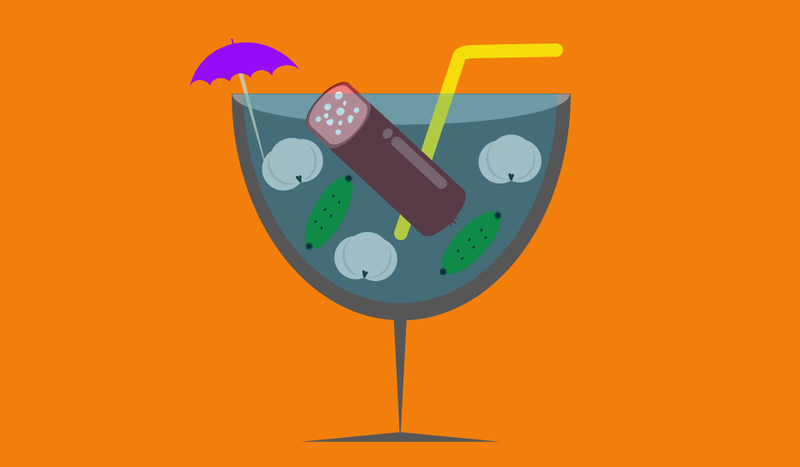 I remember, the first day when I found out that people mix vodka with coke in the UK – it made my throat tickle, my stomach squeezed into a molecule and my eyes goggled, almost popping out. People in the land of Vodka traditions drink this tipple in shots. Vodka “drinkardizers” cannot be coke or sprite – this is an absolute pervasion for all vodka patriarchs. Sometimes, Russians (as a rule it involves women) wash it down with a homemade compote, and rarely with juice. But it will show that you are a p*ssy. Shots of vodka are followed by Russian traditional snacks. That’s why there’s no need to mix the tipple with any additional drink that will reduce the taste of alcohol. 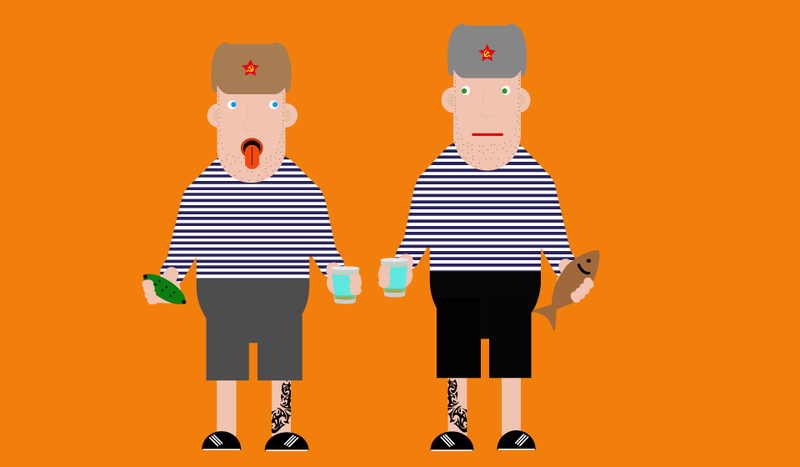 Straight after a shot of vodka, Russians prefer to take either pickled vegetables, traditional Eastern European Salo or sausages, Russian dumplings (“pelmeni”), caviar, dried fish as well as sauerkraut. The actual list is endless, these are just the most common examples. To reveal a secret, food decreases the feeling of drunkenness. 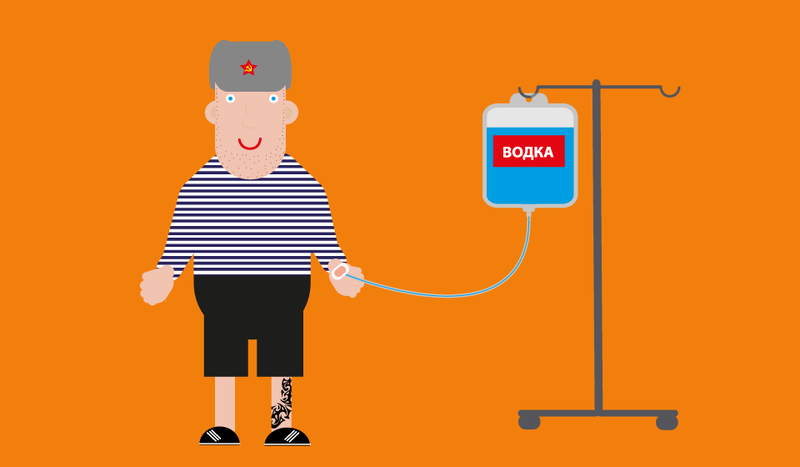 It’s not like Motherlanders have been born with the ability to drink vodka and stay sober after a litre of consuming it. This tradition provides a quality alcohol consuming ritual, reducing the chances of hangover and handing over the long night of fun. Alternatively, the real Motherland men, instead of eating food with Vodka, prefer to smell something very pungent after drinking a shot. For example, leeks mask the harsh taste of vodka perfectly. Probably, these people just want to get pissed faster. Vodka etiquette requires a table of food and a good company of people. There needs to be a special occasion to drink this Saints Drink. Vodka is not actually a beverage to consume in the nightclub. It is simply impossible to dance in the club with a shot of vodka and a pickle in hand. Nevertheless, people do dance when drinking it, but usually at the guests’ house or at home. To drink vodka means to have a long night of talks, jokes and nostalgia. People usually organise sauna sessions, karaoke or intellectual games between taking shots. Drinking vodka is not an event of getting pissed at the first place, it’s an event to communicate, eat delicious food and spend some good times. Drinking vodka is its own discipline. Follow these rules to drink like a professional Russian! Although drinking so-called “Westernised” vodka cocktails with fizzy beverages will make you pissed quite quickly, as it is known that gases are strong alcohol strengtheners, but it hurts us (Russians) to see how you destroy our fundamental traditions. We – Russians – don’t put jam over the Scotch Egg to experiment with tastes and that’s why I would like to demand a request, that if you drink our beverage – drink it properly. Stop being perverts. Respect traditions and culture, or just don’t drink Vodka at all.